This Year is sure a great one from singer Kizz Daniel and definitely Davido with the likes of Wizkid, Mr Eazi and Burna Boy. Firstly Burna Boy was recognised by Youtube as “The Artiste On The Rise” few months back and he also appeared on electronic billboards in Time Square. 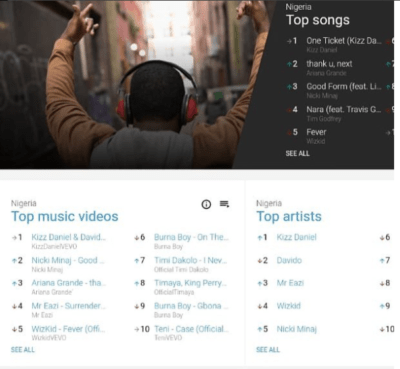 Now Kizz Daniel and Davido has earned themselves a huge recognition by Youtube Nigeria as the Top Artists presently. Kizz Daniel who recently released his “No Bad Song” after the success of “One Ticket” holds the number 1 spot followed by Davido the man with a lot of features this year as the number 2 before Mr Eazi and Wizkid. The song “One Ticket” by Kizz Daniel which features Davido has been making serious waves since its release on the 2nd of November, 2018. It has topped different music charts, Countdown and receive massive streams on different music platforms. “One Ticket” has also received love from radio, TV and cable stations and has turned people’s favourite song. The song has now gotten recognition from Youtube Nigeria as the Top song presently in Nigeria and also as the Number (1) one music video. Kizz Daniel on the 10th of December made this known to his fans via his Instagram handle that One Ticket is now the number one song on YouTube ahead of Mr Eazi’s “Surrender” featuring Simi and Wizkid’s “Fever“, also above other international artistes’ songs such as Nicki Minaj’s “Good Form” and Ariana Grande’s “Thank U, Next. Nicki Minaj and Ariana Grande being there shows that this list is made up of songs and artistes that are popularly listened to in Nigeria. Well what do you think about this, Is it well deserved?